The first was my lack of a power supply. Could’ve sworn I had one, but could not for the life of me dig it up! No matter though, one quick run to Goodwill for a $10 P4 PC and I was in business, plus came home with a bunch of spare parts! Always good. Second, I knew the printrboard I had was slightly defective. 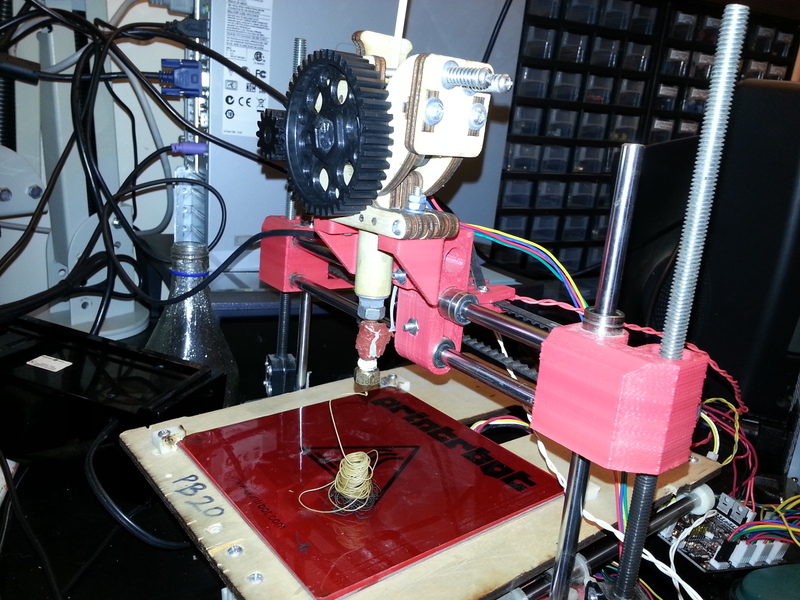 The Z endstop wasn’t functional, and as such, the printer would never stop trying to home itself. At first, I tried to prod around and fix this in firmware, re-mapping the Z endstop to the extra endstop connector on the board, but the learning curve on this was too steep for my impatient mood, so I dug out my multimeter, and a Printrboard schematic and went to work. I found after a few moments of testing that there were several bad solder joints to the microcontroller, so I fired up my soldering iron and fixed them right quick. The Z endstop was no longer a problem, and everything worked as planned. That resolved, I downloaded the precompiled binary of Printrun for Windows, fired up Pronterface, and was able to connect to the Printrboard and jog all of the axises! Success! I fired up the hot end to see if I could extrude anything, and once it came up to temperature, I told it to run some filament through. The first stuff that came out was jet black and horrible. 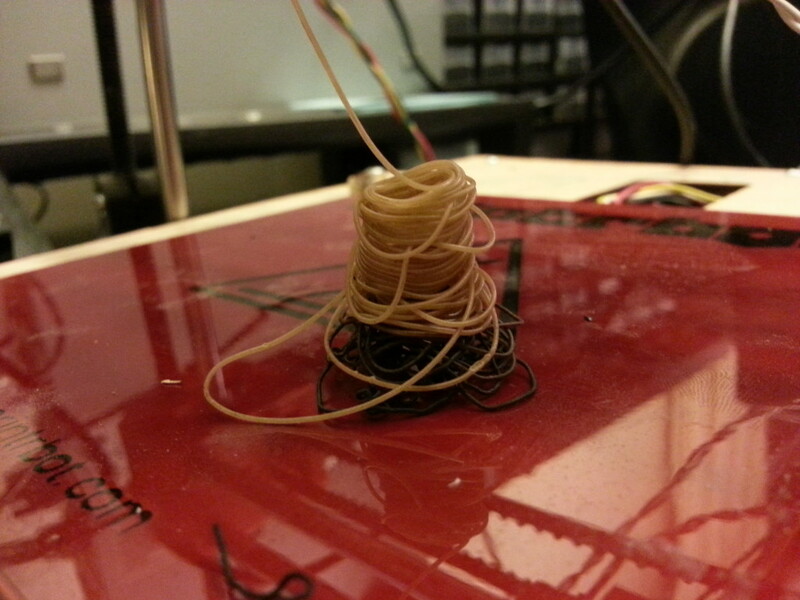 It was obvious that this used hotend had been left at temperature without running anything through it for a long time. I kept extruding until the black gave way to tan, which finally cleared up to the white colour of the ABS going into the top of the extruder. On top of Old Smokey! That’s about as far as I got this time. Stay tuned for more!